The Air Force's 18th Aggressor Squadron is based at Eielson AFB in Alaska and flies specially painted F-16s in fulfilling its role of simulating opposing air forces. Over the years its F-16s have worn a wide variety of paint schemes mimicking those used by potential opponents. Recently, the Squadron painted some of its F-16s in several variations of the "Splinter" scheme recently observed on Russian Su-34s and the Sukhoi T-50. 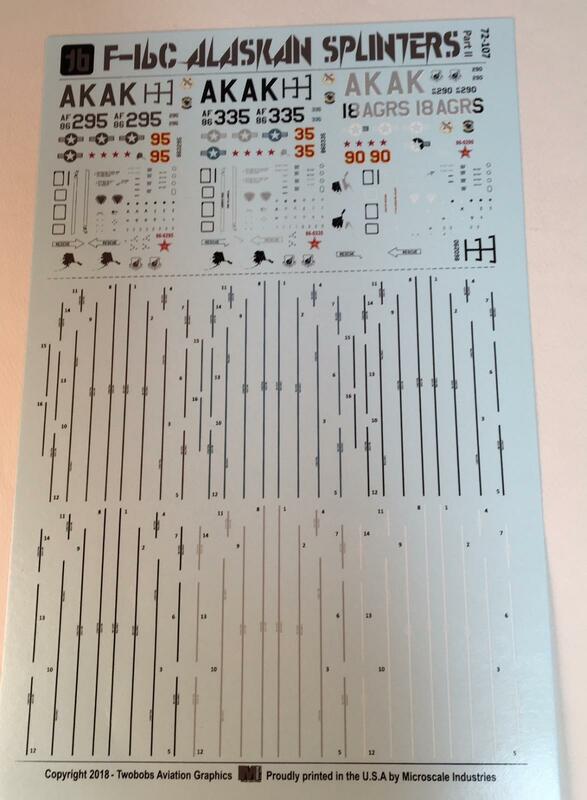 Two Bobs have now issued decal sheets in 1/32, 1/48 and 1/72 scales to allow modelers to depict these schemes. Sheet 72-107 provides markings for 3 aircraft in the "Splinter" scheme. All three aircraft are Block 30 jets, so the instructions recommend using the new Tamiya F-16C kit. One jet is painted in a "BDU Splinter" scheme which consists of 30140 Brown/34079 Dark Green/37038 Flat Black. The second scheme is a "Blue Splinter" of 35450 Air Superiority Blue/35109 Light Blue/36270 Neutral Grey. The third scheme is an "Artic Splinter" of 36628 White Grey/36270 Neutral Grey/37038 Flat Black. The splinter pattern itself appears to be the same on each of the three aircraft and looks very similar to the one that was developed by the 64th Aggressor Squadron for its F-16s (see Sheet 72-104 "Baby Got Fullback Aggressors"). The radome on all three aircraft is 36251. The sheet provides three full sets of markings and stencils so it is possible to decal an F-16 in each of the three schemes provided. The bulk of the sheet however is the six sets of wing walkway markings that are provided - one in dark grey, one in blue, two in black, one in brown and one in white. As each scheme requires two different colors due to the splinter scheme, be prepared for a fair amount of cutting and splicing to complete the walkways. The instructions sheets consist of two double sided sheets with full color illustrations giving you four full views of all three schemes. They also include an illustration of a fourth overall 36251 scheme that the "Blue Splinter" jet was delivered in, but while the instructions state that there are 1/72 scale decals included for this scheme, this is not correct. I understand the 1/72 decals for this scheme are actually included on the 1/48th scale sheet of the same name. Two Bobs also includes a four part color wheel for each scheme listing the FS595 colors for the scheme as well as a model paint cross index listing matches for Testor's Model Master, Humbrol, Mr. Color, Xtracrylics and Mr. Paint, if there are any. Only Mr. Paint's range includes all of the colors, so if you use one of the other brands, you will need to mix one or more colors. Two Bobs' decals are printed by MicroScale and they are beautifully printed and in register. The State of Alaska logo on the tail of the Artic Splinter scheme is actually in two colors and Two Bob's thoughtfully provide this decal in two parts, making it easier to line up and position it on the color demarcation line. The instructions are very helpful in illustrating where all of the markings go, including the tiny red starts next to the wingtips, and the walkway stencils are clearly numbered, greatly assisting in determining where they all go. Due to the color changes however you will still need to lay them out on the model before applying them to determine where to cut and splice them. This set continues Two Bob's high standards and gives us several interesting variations to try. As I recently built an F-16 with the original Nellis splinter scheme, and I have an F-20 kit that I have been looking for a neat "what-if" scheme for, I plan to use the "BDU Splinter" set on the F-20 and see if anyone notices at my next club meeting. This is another great set from Two Bobs and I highly recommended it, especially if you enjoy aggressor schemes. Thank you to Two Bobs for the sample decals and to IPMS-USA for letting me review them.